MONTREAL -- The first organized game of ice hockey took place on March 3, 1875 at the Victoria Skating Rink in Montreal, based on a set of rules proposed by a group of McGill University students. The game also featured a number of those students. The last quarter of the 19th century was a great period of social organization and saw the standardization of many sports. Hockey, as we know it, began in Montreal where James G. A. Creighton, who went on to become a McGill law student, was believed to have played a major role in the established the first set of formal rules. Two nine-man groups, one of which was captained by Creighton, opposed each other in the world's first-ever indoor public display of an ice hockey game. The event was played at the Victoria Skating Rink, March 3, 1875, located in the part of Montreal that is now bordered by the following streets -- Drummond, de Maisonneuve and Dorchester (now named Boulevard René Levesque). This event was promoted in The (Montreal) Gazette prior to the game and a post-game account was also published (see below). The contest was divided into two halves and played with nine men per side. The players on one side were Charles E. Torrance (captain), Daniel Meagher, Thomas J. Potter, Edwin H. Gough, William M.S. Barnston, George W. Gardner, W.O. Griffin, Francis Jarvis and a fellow named Whiting. The other team was composed of James G.A. Creighton (captain), Robert Esdaile, Henry Joseph, Frederick C. Henshaw, William B. Chapman, Robert H.W. Powell and Edward S. Clouston, along with brothers Lorne and George Campbell. By moving ice hockey indoors, the smaller dimensions of the rink initiated a major change from the outdoor version of the game, limiting organized contests to a nine-man limit per team. Until that time, outdoor games had no prescribed number of players, the number being more or less the number that could fit on a frozen pond or river and often ranged in the dozens. The nine-man per side rule would last until the 1880s, when it was reduced during the Montreal Winter Carnival Hockey Tournament. The key innovation was the substitution of a square, wooden disk (puck), which offered the players far more control than they had over a lacrosse ball. 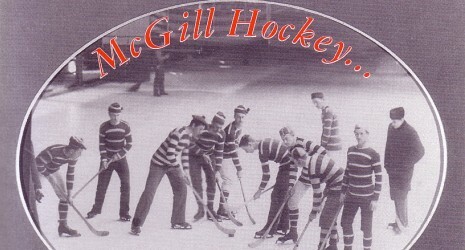 In 1877, the first organized team, the McGill University Hockey Club, was formed and in 1886, the first national association, the Amateur Hockey Association of Canada, was founded. Victoria Rink - A game of Hockey will be played at the Victoria Skating Rink this evening, between two nines chose from among the members. Good fun may be expected, as some of the players are reputed to be exceedingly expert at the game. Some fears have been expressed on the part of intending spectators that accidents were were likely to occur through the ball flying about in too lively a manner, to the imminent danger of lookers on, but we understand that the game will be played with a flat circular piece of wood, thus preventing all danger of its leaving the surface of the ice. Subscribers will be admitted on presentation of their tickets.